Then share your message on FaceBook and Twitter! 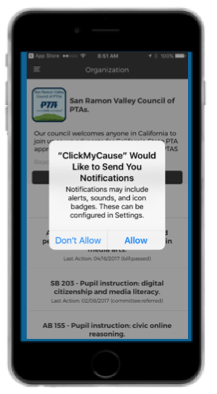 Select your organizations to send you mobile alerts. Choose as many organizations as you like to send you alerts. The first time you tap “send message,” you need to enter your street address so the app can identify your state representatives. Click My Cause does not share your personal information. Your state representatives will see your street address to know that you live in their district. Look for repeated alerts through September, as a bill passes through committees in both the CA Assembly and the Senate and finally arrives in the Governor’s office in September. Allow Click My Cause notifications. When you first download the app, you need to select “ok” to allow notifications. Otherwise, you won’t receive any mobile alerts. Keep checking for updates! You may not receive alerts if you don’t keep updating the app for the latest app version.